S7582XXUANA1 Android 4.2.2 Jelly Bean Firmware Last Updated on 5-Feb-2014. 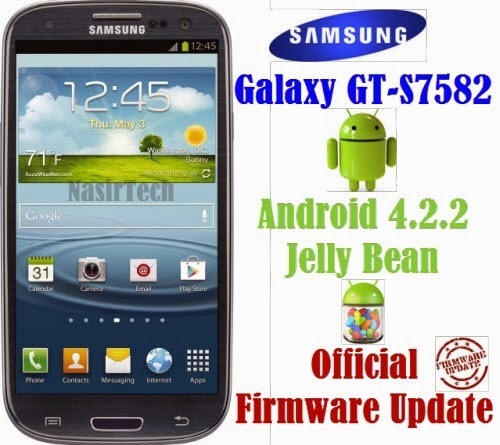 Samsung Galaxy S Duos 2 GT-S7582 recently received the latest official XXUANA1 Android 4.2.2 Jelly Bean firmware. Samsung recently started rolling out an OTA update about the firmware. However, the firmware is currently released only for Bangladesh. Hope the firmware will hit other part of the world soon. The Samsung Galaxy GT-S7582 receiving Android 4.2.2 Jelly Bean official firmware update from the month of November 2013. Samsung already released many regular firmware update for the device and here is the latest S7582XXUANA1 4.2.2 Jelly Bean firmware. If you own the device and not yet updated this latest firmware, then update the same using our simple tutorial below. The below guide will help you to download and install the firmware manually through Odin. If your Galaxy S Duos 2 S7582 already running on the Android 4.2.2 Jelly Bean, then you can only expect few bug fixes and performance enhancement with this update. So, want to update your Galaxy S Duos 2 S7582 to the latest S7582XXUANA1 Android 4.2.2 Jelly Bean firmware? To install in official way, either you can go for OTA (over the air) from Settings-About Phone-Software Update or download firmware through the Samsung Kies utility. However, most of us prefer manual way to update official firmware. So, in this article you’ll find step by step manual guide to update the latest Android 4.2.2 XXUANA1 firmware on your Galaxy S Duos 2 S7582 through Odin. "The firmware is released only for the Samsung Galaxy S Duos 2 GT-S7582 model, so don’t try this in any other android device. Check your device model number from Settings-About Phone. Also the tutorial is based on Windows PC. Follow all the pre-requisites, procedures and steps carefully to avoid breaking your phone". Samsung rolled out the firmware for the following countries. The firmware which are unbranded or not locked to any carrier, no matter of which country or region, can be flashed on any Galaxy S Duos 2 GT-S7582 model. All the above pre-requisites are very important and must follow before proceed to installation guide. Hope you get all the above points. Now, go through the below tutorial to install Android 4.2.2 S7582XXUANA1 official firmware on Galaxy S Duos 2 S7582. Switch off your phone and boot Galaxy S Duos 2 S7582 into Download Mode by pressing and holding the Volume Down+Home+Power buttons (long press until the boot screen appear), now press Volume Up key to proceed to Download Mode. Congrats! you have completed the tutorial to update Android 4.2.2 Jelly Bean official firmware on Galaxy S Duos 2 GT-S7582. Hope you successfully done the update process. If you followed everything as mentioned in the above tutorial, then your Galaxy S Duos 2 should now running on the latest Android 4.2.2 Jelly Bean build version XXUANA1. You can confirm the firmware update details from Settings-About Phone. If you stuck in any point or find any issue with the download link, then feel free to contact with us using the comment form below. Can you please tell if it will work on Galaxy S Duos GT-7562L. can I change samsung galaxy s duos GT- s7582 android version 4.2.2 to 4.3???? Could you please tell me where I download the 4.3 firmware? Could you please tell me where I can download the french firmware for Samsung Galaxy 2 Duos GT-S7582. amm i need help .. i flash the country specific firmware bcoz im a carrier branded .. and after i rebooted it .. no sim card or unregistered network .. what do i do to fix this one ?? Samsung Devs say that S Duos 2 will be having an official kitkat software update on April this year! Hi, Mohammad Nasir. I am using Samsung galaxy s duos GT-s7582. I have rooted my phone. when I am trying to move the application to external memory, I get error unable to move. All downloads are saved in storage/emulated/0. when I upload the song and movies directly to the mobile, I can't play the song and movie. Finally it has deleted. Could you please give me the solution for this. i hav Q. for Admin. do you have gingerbread for galaxy s duos 2. The device comes preloaded with 4.2 Jelly Bean, so there is no hope for that. But why you want the older version? Or ICS abilable on galaxy s duos 2.? No, you can expect 4.3 Jelly Bean or 4.4.2 KitKat but below Jelly Bean is not possible as the phones comes with 4.2 Jelly Bean out of the box. Aap ko hindi aata hai.? Kya mai hindi se chat bate karu? Toh baat cool milakar yeh hai. Mujhe Chainfire 3d support karne wala os jaruri hai. yaa toh ICS os jaruri hai. Kyoki alag alag tarike ka graphic wala hd game support karne ka triks sikhadijiyega. Bad company 2 battel fild game galaxy s duos me full graphic pe chalta hai .aur galaxy s duos 2 pe full graphic nahi aata. Is liye mera quetion thora sa pechida hai. Dear sir is there any hope that Samsung galaxy s duos 2 GT S7582 will get official kitkat update???? Nasir, Updated, But somehow i cannot Root it Again .... Any Idea ? I am using LG L7 II duos P715, can i installed Samsung S7582 ROM on LG L7 II p715 ? how to installed custom ROM ? i Cant use my phone how can i back it again to its original one? can i update s7582 firmware on my s7562? Sir, Can u plz upload official jelly bean 4.2.2 update for samsung galaxy s duos indian version as soon as it gets confirmed by samsung? Thankin u.. If u want to root ur phone then go to kingo app. its root the device, i have rooted HTC, LG, Micromax, samsung etc from this software. just google it for kingo root app. i'm from Spain. My S7582 has a huge problem. When it loss range (signal drop), it can't recover signal again so i can't call with both sims...awful. I'd like to force band range with "service mode" via dialer code *#0011# but menu doesn't work. it isn't power save mode?? Can Some One Notify me when the Kitkat Update will be launches. It seems I can't install custom ROMs for samsung galaxy s dous 2, after installing of any custom ROM (I downloaded), on clockwork recovery and after booting still the same stock ROM. Its like it just pasted the custom ROM files on phone memory and doesnt erase and replace the original stock. And samsung phones jellybean up is a hustle, bec the datas or obb files of the games cant be on SD card, only on Phone Memory that suxs. if you have phone that has only 2gb of phone memory like sg s duos 2 you just wasted money. Rooting Samsung galaxy s duos 2 is easy to root heres the site. are there any official optional jellybean firmwares for S7562? can we try to flash other phones stock roms on S7562?